Left out of his crate, one experimental afternoon, our puppy, Fender, took his anxiety out on our leather armchair. Posted May 15th, 2014 . Ha ha. My dane did the same to ours!! Ours ate the whole settee. Ours ate the carpeting – twice! When will we learn?? Oh such a sad face! My chocolate lab mix ate my leather recliner sofa. Then ate it about half a dozen more times. I’m not getting a new sofa till he’s out of this phase. My sympathies to you. Our GSD puppy has eaten one futon, two upholstered chairs and a piece of new carpeting in the center of a room. The room had been carpeted just two days before. (She is just one-years old,) We continue to love her dearly, though. Through your pain and expense I again have decided not to get another dog…. it is like childbirth you always forget how bad things can be and think it wasn’t that bad. Except for puppies keep reminding you over, over, and over again. 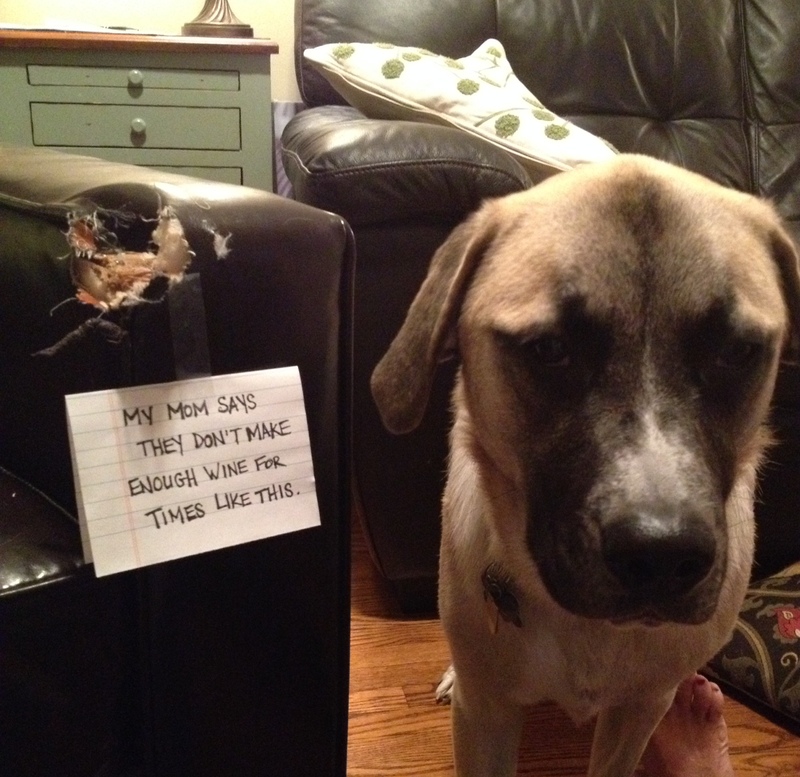 I think I will just live vicariously through dog shaming! Your puppy was just marking his spot on the couch.